Bella Chartrand gets much of her style and inspiration from Esteban Chartrand, her great-great-grandfather whom she is named after. Esteban Sebastian Chartrand Dubois was born in the Limonar province of Matanzas, Cuba on October 11, 1840. During his lifetime, Chartrand became a highly respected artist, exhibiting both in Cuba and the United States, including the 1876 Centennial Exhibition in Philadelphia. Esteban and his brothers, Philippe and August, formed the most important dynasty of Cuban landscape painters of the nineteenth century. Chartrand, whose family wealth derived from the sugar industry and had business interests in the southern United States, was actively encouraged to paint and traveled to France in 1854 and again in 1864 to further his studies where he was a pupil of the famous landscape painter Théodore Rousseau. 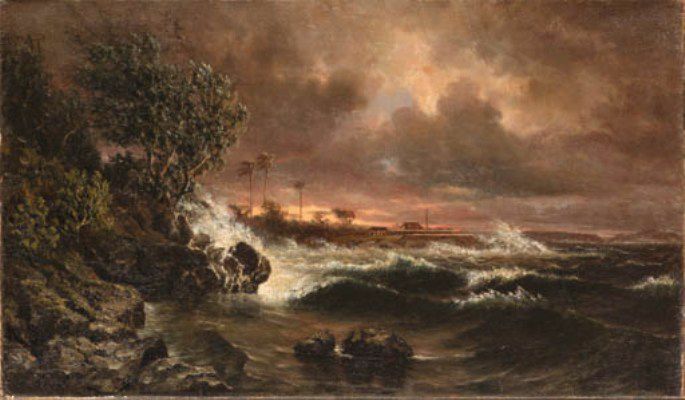 Upon returning to Cuba, Chartrand reinterpreted the romantic atmospheric style of the Barbizon School he had attended in France in the context of the tropical light and landscapes of the Caribbean. Under the influence of Corot he painted Cuba’s landscape and flora in such great detail but in dark tones that did not correspond to the typical tropical colors and light. He instead rendered light and form in terms of tonal values rather than by color and drawings. One such example can be seen clearly in Esteban’s BAHÍA DE MATANZAS (Bay of Matanzas) oil on canvas painted 1873. Instead of painting what others may perceive to be reality of that which surrounded him, Esteban instead translated nature through his own poetic eye which allowed him the license necessary to achieve dramatic moods and tones that you can feel literally drawing you into the painting as you gaze upon any of his works. In Bahía de Matanzas, theory and anecdote are lost in the emotional undercurrent of the extensive expanse of water that hypnotically leads the viewer into infinity. Chartrand boldly accentuates the vast distances with light, which like the raging waves of the sea, appear and reappear with a calming echo, each time just a little but further away. 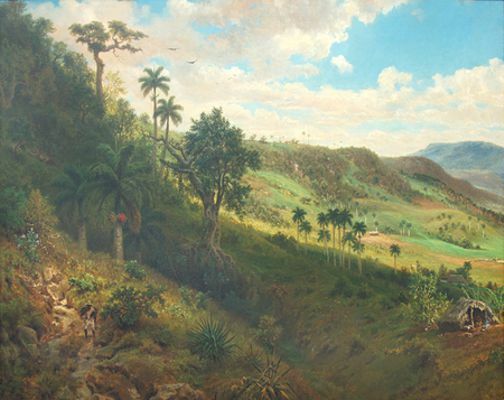 Because of his unique style of painting, Esteban very quickly became the most fashionable Cuban landscape painter of the late 19th century, especially among the landowners of Matanzas. In 1866 and 1867 he received his first awards for his works in Havana, including Las Flores de Oro (The Gold Flowers), in Matanzas. In 1870 he exhibited at the Floral Fair of Charleston, South Carolina and in 1876 he was offered a position as a Professor of Landscape at the San Alejandro Academy, but could not meet the obligation. That same year, he presented the painting Valle del Yumuri (Yumuri Valley) at the International Exhibit for the Centennial of the United States, in Philadelphia. In 1881 he showed his works again at the Exhibit of Matanzas and on June 30 of that same year, perhaps as a premonition of his death, Esteban documented, in his own handwriting, a list of all the paintings he had created since his finished studies in 1865 totaling 107 oil canvases in sixteen years. Soon after, Esteban traveled to Hoboken, New Jersey in search of milder weather and relief from the ever looming and persistent tuberculosis he had been suffering from for so long only to be met with an untimely death shortly thereafter. Just a few short months after his 43rd birthday, Esteban’s battle with Tuberculosis came to an end, overtaking him, far from his beloved island, that fateful day, Saturday, January 26, 1884. Visit Bella’s PORTFOLIO now to see more details about Esteban Chartrand’s breathtaking works of art and where you can bid on Bella’s growing collection of watercolor, oil, and acrylic paintings and own a little piece of history.